This is just a very simple beef stew that I decided to cook for dinner because I was randomly craving for it. If I’m not wrong these are probably beef cheek and shin cuts. Until I get a simple beef stew! 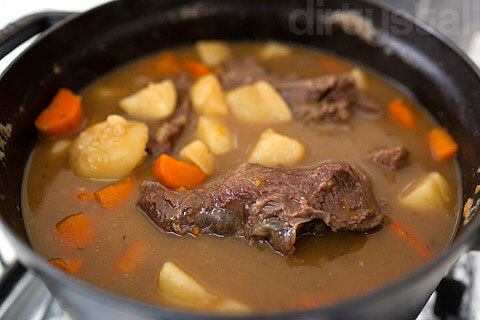 2 Responses to "A simple beef stew"
At last you are back to cooking! Been waiting for a long time for this! Looks good, can you deliver to Yishun? LOL =P Jking. – where did yo buy the beef stock from? – How many kg of beef to 500g of stock? Haha thanks! Actually I cooked this quite a long time back, now can finally post it after finishing my Tokyo entries. 1. I bought the beef stock from Huber’s Butchery in Dempsey. However I think Cold Storage sells Campbells beef stock. In a pinch you can use chicken stock or even plain water instead. 3. Cooking the beef for long is actually to make tough cuts of beef like the ones I mentioned in #2 tender through the breakdown of the tough connective tissue in the meat into soft collagen and finally into gelatin.